Years and years ago, my mother, and her mother tried to teach me to knit – I had bursts of being interested, but mostly I was disinterested. Making clothing out of fabric was one thing, but making the fabric in the first place? Well that’s quite another! Recently though, I have had a change in my work circumstances: I now work from home most days, but on the other days, I travel on the train for about 4 hours a day. I try and work for most of the journey, but when I’ve been going for 11 hours, I need a break. I would love to sew at these times, but unfortunately I can’t really find any bits of sewing that are mobile – I’ve tried unpicking, but I have to really plan my mistakes in advance for that to be an option! I settled with reading sewing blogs on the train, but the connection isn’t always that great. In the sewing blogsphere, knitting comes up on a fairly regular basis; New Roobeedoo, Marilla Walker, luckylucille, Peneloping amongst others knit on a fairly regular basis. 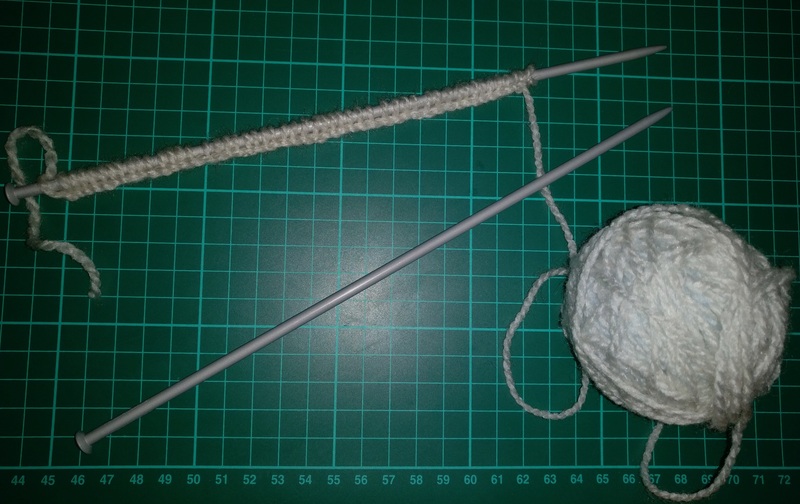 And so the seed was sown – I could try my hand at knitting again. My daughter wants to learn how to knit, and so I started using her kit to practice the knit and purl stitch – I did have to ask Mr SewSmart to cast on for me though. Well, that was it – I was hooked again. 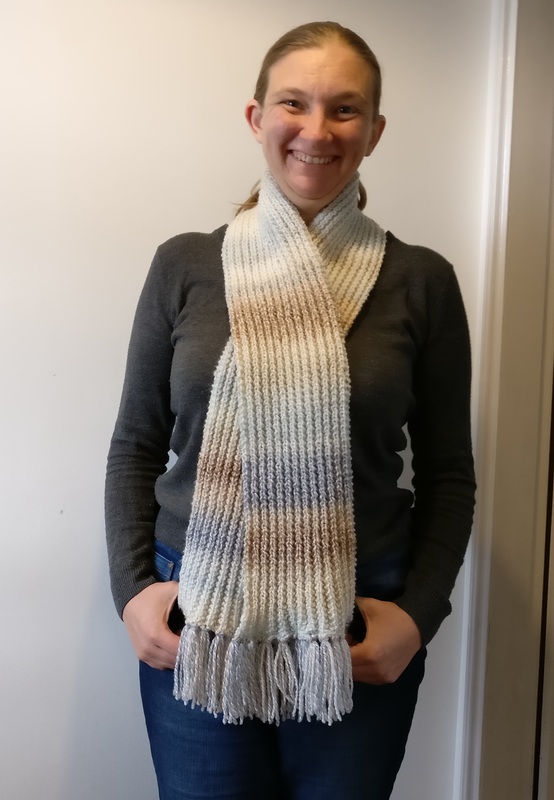 I looked for a pattern – I didn’t want anything complex – I decided I was looking for a scarf pattern – no increases or decreases – no lacy stitches, no cables, just a plain straightforward rectangle, that I could pop in my laptop bag and take out when the need struck. I settled on the Mistake rib scarf pattern, figuring that the pattern repeat was about the right level of complexity for me. As for wool and needles, I spoke to my mum, who, instead of suggesting a wool type and needle size, handed me over some (large) scraps of wool and a pair of size 7 (UK) needles. After a brief (10 minute) introduction in how to cast on (where she helpfully started me off!) I was away. A few hours later, I had cast on 51 stitches (48 + 3). 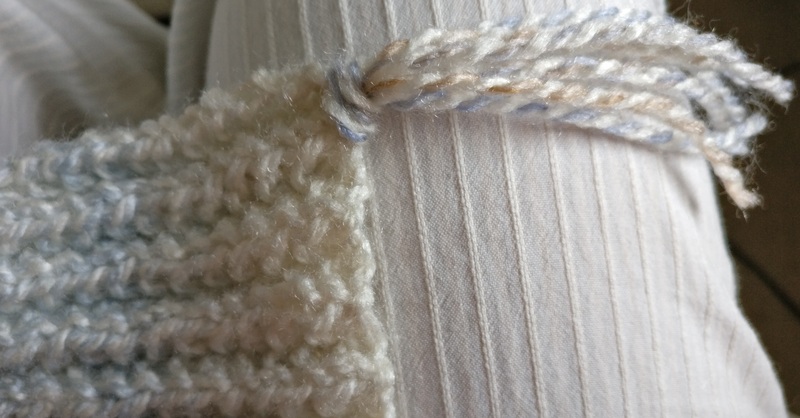 These were my first ever cast-on stitches – I would always try the knitting thing, but casting on was a different matter! The next day, I spent a significant amount of time wondering why, when I transferred from knitting to purling I was adding a stitch – this scarf was destined to either be a single piece of wool, (after being taken to bits several times) or a triangular shawl as I gradually added on more and more stitches! 1 youtube video later and it was obvious that I needed to bring the wool in front of the needle when I moved from knit to purl. After that, the scarf came together rather well. 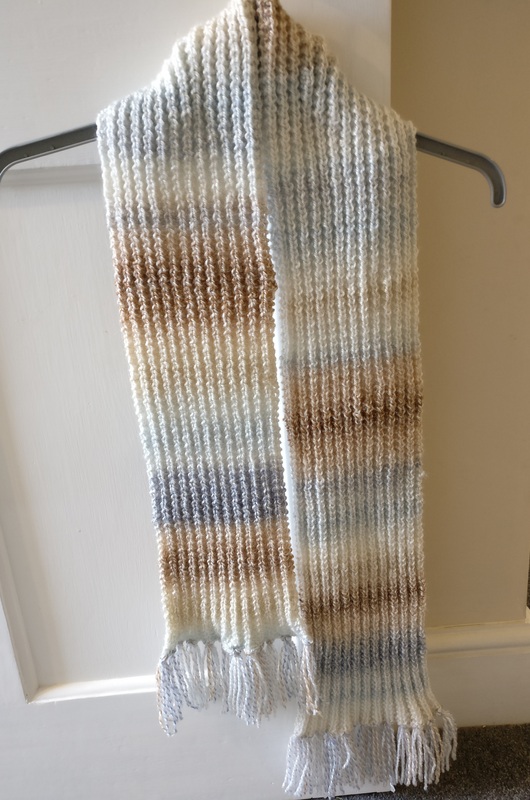 After a week of knitting in front of the tv, every time I sat down with a coffee, basically every spare minute I got (as well as on the train) I had about 60cm of scarf – about half-way! The thought then occurred that it would be a nice surprise for my mother if I gave the scarf to her for her birthday at the end of August (yes, ok, a scarf for a summer birthday doesn’t really make sense I know 🙂 ) that meant that I had to find out what the wool actually was in order to buy enough to finish the scarf. 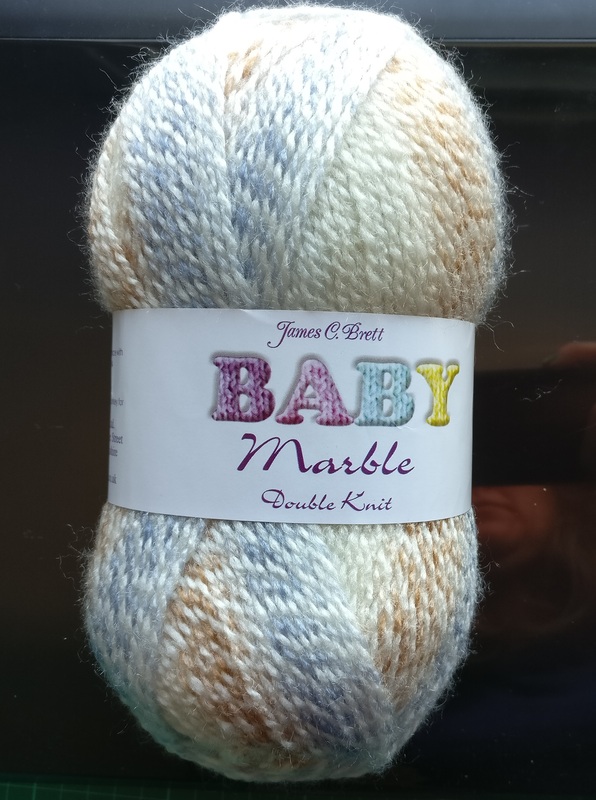 After much research (ok, discretely speaking to mum and wandering around my local yarn supplier) I found out that this wool is Baby Marble from James C Brett in the blue & brown colourway. 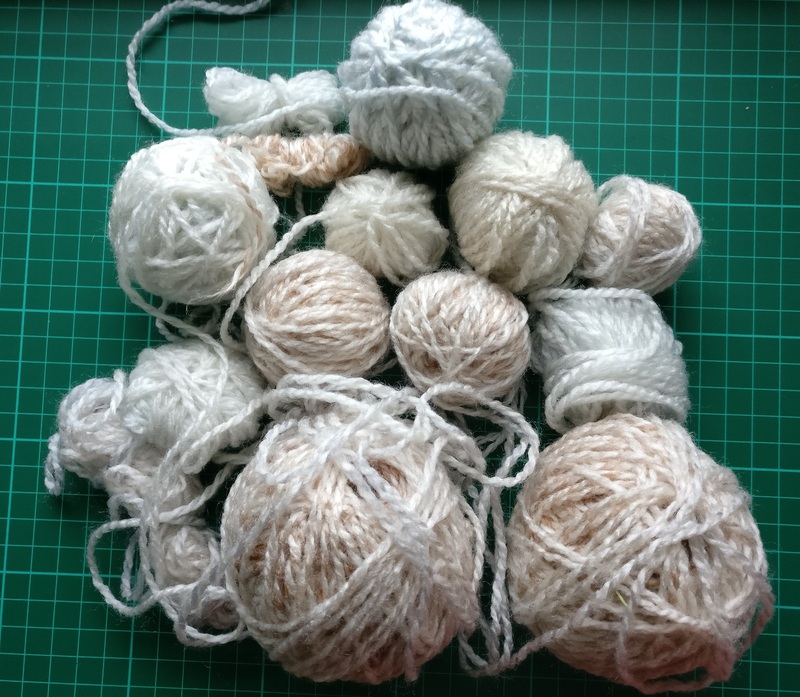 I wasn’t sure how to join the yarn together, and ended up just knotting it, and making one big ball, with lots and lots of knots out of all the little balls. This was actually more of a challenge than it sounds, as I wanted to get the colours to flow in a similar manner to the full ball; this meant unravelling each of the balls to get ends to match – that’s one hell of a jigsaw puzzle! This did mean that I ended up with a huge number of knots to weave into the scarf, this took ages, and after ending up with half of the ball I had bought left over, I realised I would have been better to have just used the ball for the scarf! Oh well, every day is a day to learn 🙂 After that, I only had one difficult stage left – actually stopping knitting without the scarf unravelling. This is where I did something else I have never done before – I cast off the stitches. I decided that the scarf would look a bit more feminine with tassels, so I decided to add some. I simply cut 13*4*2 (13 ribs on the mistake rib pattern *4 threads per tassel *2 ends of the scarf) lengths of wool (I think they were about 15cm in length each) and then simply knotted them to the scarf by grouping the threads into 4, and then passing the centre of the 4 threads through the end of the scarf and passing the ends of the tassels through and pulling tight. I then cut each tassel to the length of the shortest thread, and trimmed each of the tassels to the length of the shortest.